This is an elementary education major's collage. It's part of her visual diary, an assignment I give mostly non-artists to document what is visually stimulating to them over the semester. 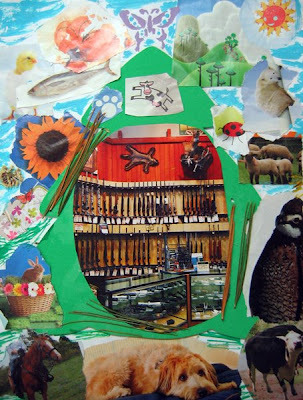 How precious: butterflies, puppies, sunflowers, ducklings, bears, bunnies......GUNS??!! The cow is not jumping over the moon, it's jumping over the GUN STORE??!! Where I'm from this would call for an intervention or at least a photocopy to the staff psychologist. But this is typical of where I live. The second amendment is sacrosanct. Disturbingly, I saw more guns in the visual diaries this semester than even crosses.